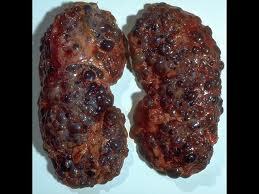 A:Polycystic kidney disease is a disease in which a large number of fluid filled cysts form within the kidneys. These cysts are present from birth in affected patients but they start off very small and then gradually increase in size until (may be in adulthood) eventually they compromise the surrounding normal kidney tissue and cause kidney failure. How they compromise? Cyst is a fluid filled cavity which i sourounded by epithilial lining. With time the cysts grow in size and compress the normal kidney and sourounding structure, cysts may compress the blood vessels which may result in ishemia of important organs, like intestines and kidney themselves.